Global obesity has long since been reported on but we now know that the problem is escalating out of control. 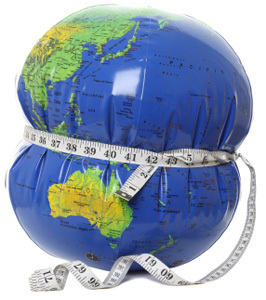 This short blog post simply sets out the facts on the global obesity crisis. In 1975 just under 5% of the world population was classed as being obese (BMI 30+). In 2014 the level of global obesity has risen to 12.8%. To put these figures into context the number of obese adults has risen from 105 million to 641 million people. A massive rise in the numbers of people now classed as obese. It must be noted that the world population has approximately doubled during this time period. China has around 90 million obese adults, making it the leading country in the level of obesity. The United States of America being a close second in the measure global obesity levels. Interestingly the proportion of underweight adults (BMI <20) worldwide has decreased. This is one positive to be taken from the figures. When looking at weight and health, the underweight population are also at increased health risk. It is too often the case that health is forgotten and the temptation is to look at the necessity to lose weight being labelled a cosmetic ideology. Excess weight IS a very good indicator for health risk now, and in the future. The Lancet published a study estimating a fifth of the world's population and a third of the UK's population will be obese by 2025. We must act now and not leave it to future generations to deal with. The NHS is constantly in the news because it is at breaking point. Funding in the NHS is at an all-time high. This is not unexpected, owing to the rise in population and greater numbers of improved medical solutions available. However it really must be partly down to us as individuals to reduce the burden on the NHS. The health services around the world also need help by reducing the world population's excess body weight and all doing our part in cutting out this obesity crisis.